Chef Walter Staib brings the 18th century to life in his cooking show. Watch all thirteen episodes of season four as he visits Malaysia, Jamaica, Guyana the homes of John Adams and James Monroe and recaps the first five presidents. He cooks sophisticated recipes, such as tripe a la mode, rib roast and stuffed veal breast and Martha Washington’s ‘excellent cake.’ Staib also presents simple mainstays, including beef brisket and potato, cauliflower casserole. 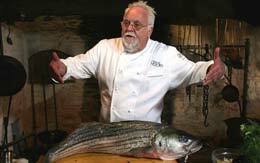 Chef Walter follows The Freedom Trail, a walking tour of famous sites from 18th century Boston, then inspires us with more historic Boston favorites, Clam Chowder and Tripe a la Mode. “The Midnight Ride of Paul Revere”, Henry Longfellow’s poem, made an obscure silversmith into an enduring Revolutionary legend. The poem is retold as Chef Walter accompanies the prose with Lobster Pie and Deep Fried Quail Eggs. John Adams, 2nd President and a founding father, feared history would not remember him. Chef Staib honors Adams with a classic New England Boiled Dinner, and visits Adams’ birthplace home in Quincy. 18th century Antigua was home to Britain’s second largest naval port, commanded by Lord Admiral Nelson. Chef Walter invokes these spirits in his preparation of Seafood Water and Pumpkin Pancakes in the shadow of a sugar plantation windmill and archeological dig. St. Lucia is an island of mixed cultures: East Indian, African, French and British. The island played a critical role in winning the American Revolution. But it’s the cultural stew that Chef Walter blends in these brilliant recipes: Curried Chicken and Buillion. Rum was so valuable in the 18th Century that some preferred it as currency. We travel to Guyana, where Rum is made today in much the same ways as before, and visit an Amerindian village and 700 feet high Kaieteur Falls, Chef Staib cooks traditional Guyanese dishes using local ingredients. Catchup originated as a fish sauce in Asia. From there British sailors incorporated it into their cooking. Chef Staib travels to Malaysia to trace the origins of catchup visit an organic farm, and prepare local Malaysian specialties in bamboo rice. The freedoms asserted in the Declaration of Independence are a direct result of William Penn’s “Grand Experiment”. In this episode, we visit Penn’s North American home and learn about his planned city, Philadelphia. In Penn’s honor, Chef Staib prepares Oxtail Soup and Rib Roast with Yorkshire Pancakes. 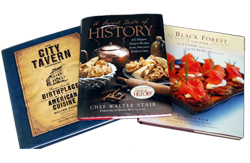 Three seminal cookbooks are the inspiration for Chef Walter’s 18th Century American recipes: Mary Randolph’s “Stuffed Veal Breast, ” Hannah Glasse’s “Braised Veal Heart and Martha Washington’s Excellent Cake. Our 5th President, James Monroe, was taught law by his close friend and neighbor Thomas Jefferson. We learn about the Monroe Doctrine, and Chef Staib cooks at Monroe’s Ash Lawn estate, preparing Fried Lake Perch and Kohlrabi in his honor. At the end of the 17th Century, Port Royal in Jamaica was awash in pirates, including famous Captain Morgan. Their endless partying suddenly came to a stop when an earthquake gobbled up the tawdry town. 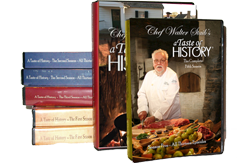 Chef Walter visits Port Royal to see the amazing intact underwater city, then cooks on the Rio Grande river, as the Arawaks have done for centuries. Coffee came to Jamaica in 1740. We climb Jamaica’s famous Blue Mountains to visit a modern-day coffee plantation, and Chef Watler prepares an elaborate Jamaican Plantation brunch. 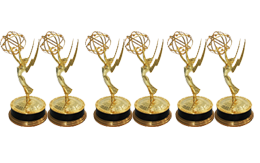 13 Time Emmy© Award Winning Chef! Keep The Show Going Donate Today! Tune in as Chef Walter Staib captures the delicious sophistication of the 18th century recipes that America's founding fathers enjoyed.